When thinking about teaching kids to read, what comes to mind? Chances are, you think about the alphabet. We teach kids that catchy tune, slap some letter magnets on the fridge, and drag out the alphabet puzzles. That’s a great start! But what kids really enjoy is getting your feedback about how they’re doing with all of those activities. Remember, YOU provide the energy that grows kids into readers! Another way kids learn the letter names and corresponding sounds is from watching videos, but use caution. Not all videos are created equally. Have Fun Teaching’s A-B-C Rap. Check out the video: Click Here to Watch. They make each sound only one time. This is very important. When kids are decoding words, we don’t want them to say, “/b/, /b/, /b/, /i/, /i/, /i/, /g/, /g/, /g/! When associating a sound with a letter, we should make the sound one time. They make a pure sound for each letter. For the letter s, they make the sound /s/ (like a stream of air, through a toothy smile) and not /suh/. They show both the upper case and lower case letters, correctly formed, throughout the song. They indicate that two letters have two sounds (q = /kw/ and x = /ks/). That means that the word fox actually has four sounds. Hm. 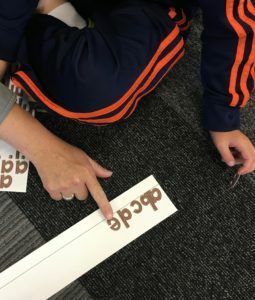 Even if the spelling doesn’t appear to follow any phonics rule that you’re aware of, encourage your child to make the sounds so that they’ll see how they’d imagine that the word would be spelled, and connect that, in a meaningful way, to how the word is actually spelled. For example, many kids spell the word want like this: wunt. Right? Who wouldn’t? It makes sense. I teach my kids to go ahead and write it that way, but then to recognize that that’s not the way we see it in the books we read. I teach them to catch the incorrect spelling, and to just add a rainbow onto the top of the letter u to turn it into a letter a. In the same way, I encourage my students to make the sounds when decoding true “sight words”- words kids just have to remember – such as said. My kids (who’ve been through Foundations classes) would say: /s/ /ay/ /d/ -sayd. And that’d be decoded correctly, but it’s not what the word actually says. So, now what? Just a little explicit (& cRazY) instruction can go a long way. With a little teaching and meaningful repetition, kids are not nearly as discouraged as adults with a few inconsistencies. If you have a preschooler, you may hear seemingly knowledgeable folks encourage you to label everything. You know, a card with c-h-a-i-r taped to the chair and a table with t-a-b-l-e. Please smile politely at those people, but ignore that advice! We DO NOT want our kids to learn words by memorizing how they look. We DO want them to learn that letters are the keys to our code-based language, and that the code is knowable. Do you have any questions or comments? I’d be happy to hear from you! Leave a comment below, or email me at christy@drchristinawilliams.com.